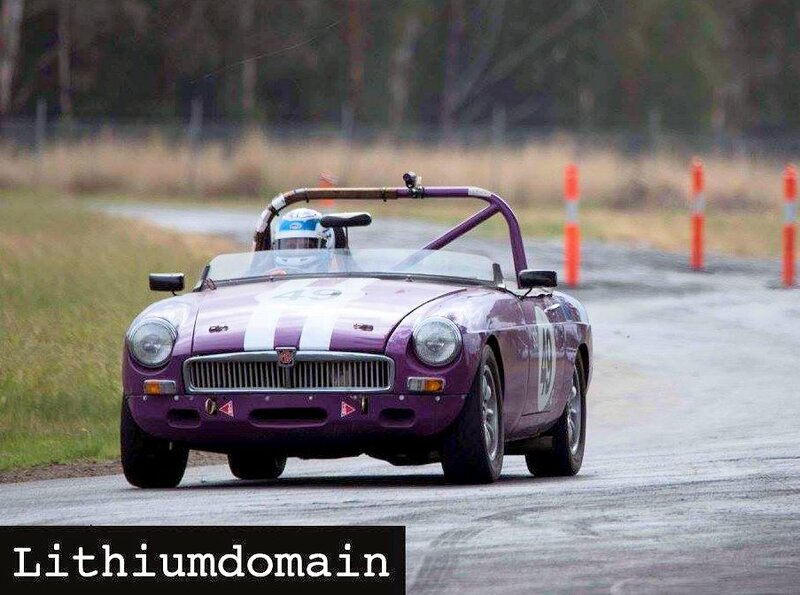 VICTORIAN HILLCLIMB CHAMPIONSHIP Round 6 – Shepparton (DECA) Sunday 30th April. With the 7-Round series winding up and the outcome of many classes already settled, competitor numbers were somewhat down on the earlier rounds. However, fifty-three starters fronted up to tackle the short but very technical DECA road course at Shepparton, which isn’t so much a hillclimb as a one-lap sprint circuit that includes a slight change in elevation, a couple of chicanes and some fabulous corners. The surface of the track has always been quite patchy, but it now seems to be in greater need of repair as there is evidence of it breaking up in places. A situation not improved by letting a bunch of brain-dead Neanderthals onto the track for a burnout competition earlier in the year. Our Club’s numbers were also down, with only David Anderson and Jane Vollebregt in their MGBs, and Steve Schmidt’s Cooper S contesting this round. David didn’t have much luck, his clutch thrust bearing collapsed after the first run and although he gave it a second try, there was little point continuing on and perhaps causing more damage, so the car went back on the trailer and Dave had a relatively relaxed afternoon. His first run time of 37.20 was good enough to place him second in class, but wasn’t enough to trouble Mark Patane’s Alfa GTV which won the Up to 2-litre Sports Car class with a time of 35.09. Jane’s MGB is less modified than David’s car and qualifies to run in the Marque Sports Car class. Jane’s best time of 40.45 was on her forth run and it placed her in third place behind Shane Bolger’s MGA and John Read’s MX5 which won the class with a time of 37.91 seconds. 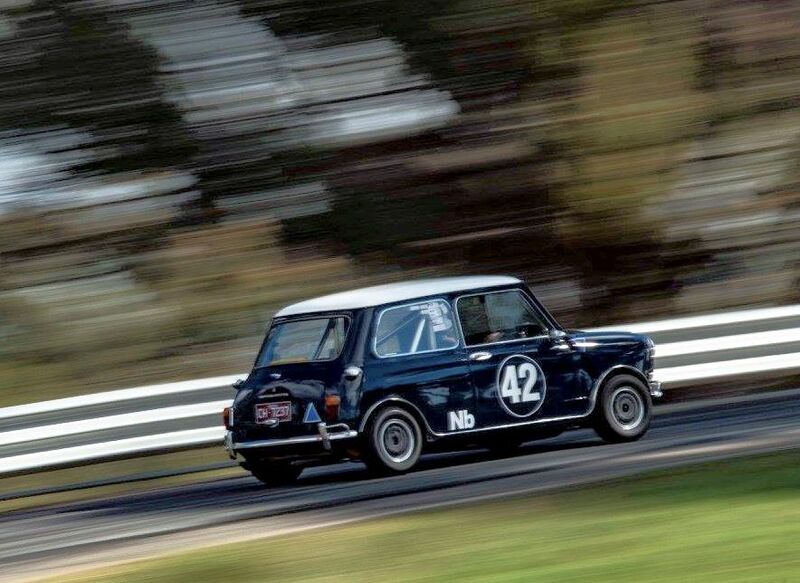 There were plenty of Minis competing at Shepparton, it’s a track that suits the little, front-wheel-drive racers and they always place well in outright terms as well as in their respective classes. As usual, the Coopers of Steve and Peter Weymouth-Wilson battled it out for victory in the Under 2-litre Historic Touring Car class and both drivers had a share of the lead during the day. At the conclusion of the 5th and final run, Steve’s 36.74, recorded on Run 3, was the quickest of the times , so he took the class win from Peter by 0.16 of a second. The Shepparton and District Car Club host the DECA round of the Championship each year and it’s always a very friendly and well-run event. This year the catering crew excelled themselves with egg and bacon rolls for breakfast, followed by a hearty beef and barley soup for lunch with homemade cakes and slices laid on. Well done to all concerned, I’m already looking forward to next year.